ZAKA has undertaken a protracted three-year campaign to receive permission for the historic search and recovery mission, including requests made at the highest level of government. 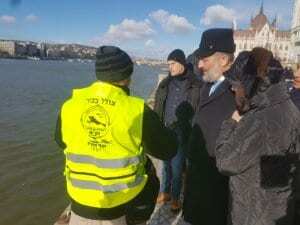 The decision to allow ZAKA divers to commence work was announced following a meeting this week between Interior Minister Aryeh Deri in Budapest with his Hungarian counterpart, Sandor Pinter. The organization is well-known and respected in Israel, undertaking often harrowing but holy work in some of the world’s worst disasters or terrorist atrocities. Their remit, as stark as it seems, is to collect as many body parts of a Jewish victim as possible – especially in a terrorist explosion – so that it can a person can bury the bones in accordance with Jewish law. In this particular instance, the movement of the water and boats, natural decay and even repair work to the bridges over the Danube all add to the logistical headaches of the project. At the start of the Second World War there were more than 800,000 Jews (according to Nazi racial laws, i.e. at least one Jewish grandparent) living in Hungary, the majority in Budapest. They lived relatively unscathed until 1944, when the pro-Nazi Arrow Cross party took power. They began to enact anti-Jewish pogroms and sent hundreds of thousands of Hungarian Jews – in a matter of only a few months – to Auschwitz. Yad Vashem, Israel’s Holocaust memorial estimates that 565,000 Hungarian Jews were killed in the Holocaust.